A touch of winter weather on Mauna Kea summit with light snowfall this past week. Cloudy skies kept Mauna Kea hidden for most of the day from East Hawaii Thursday (Feb 23). But the summit access road on Mauna Kea was re-opened after the National Weather Service cancelled the storm warnings as ice melted off roadways. 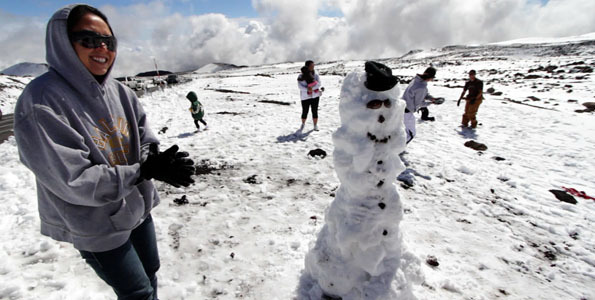 The storm system which passed over the Big Island brought snow to the summits of Mauna Kea and Mauna Loa. Folks spent Saturday brushing up on their snowman building and snowball fighting skills.